Try the tomato creamy soup with mozzarella strips made with Petti tomato: here is the full recipe! Perfect for the winter season, the recipe for tomato creamy soup with mozzarella strips is soft and easy to prepare. You can use Il sublime, Petti’s organic datterini passata, to make it even tastier, thanks to its sweet Tuscan organic Datterini tomatoes. Made with simple and genuine ingredients, the tomato creamy soup with mozzarella strips is super easy to prepare and will delight your guests with its soft and embracing taste. Made with genuine ingredients, this delicate soup is the best expression of the Italian flavors and will give you the impression of being in Italy on a typical winter day! In this recipe you will find mozzarella, a traditional Southern Italian cheese made from Italian buffalo’s milk by the pasta filata method: delicious and very delicate. Here is the full recipe for the tomato creamy soup with mozzarella strips! Clean and slice the onion thinly and put it to simmer in a pan with oil. Once softened add Il sublime, Petti’s organic datterini passata , salt and cook for about 15 minutes. Cerignola variety: they are big olives both green and black. The green one has a mild flavor, while the black is softer and sweeter. Gaeta variety: they are small brownish black olive with an intense flavor. Sicilian Green variety: they are also called Sicilian Colossals and they are very big olives with a dense and a little bit sour flesh. 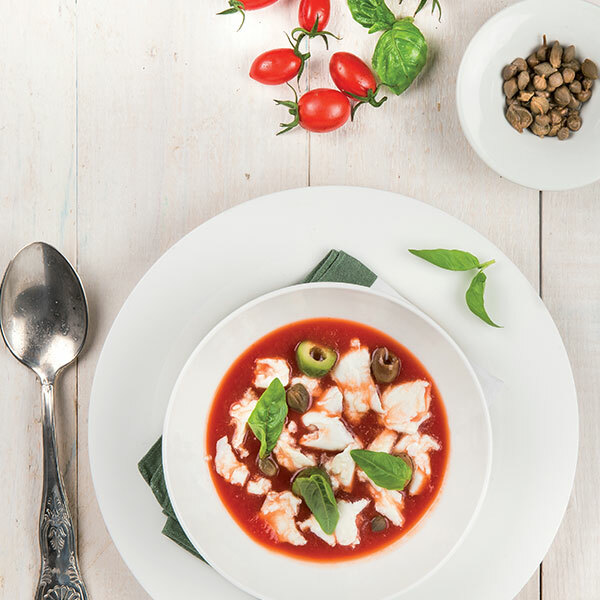 Serve the warm tomato soup in a at dish, garnishing with mozzarella cut into strips, olives, capers and the remaining basil, finally sprinkle with shavings of almonds. Enjoy the tomato creamy soup with mozzarella strips!